Beavers are monogamous animals who start families by mating every year and staying close to their young for several years after birth. These young, called kits, are born highly developed physically, and may even take to the water the very day they are born. Even so, they live with their parents and siblings for years before leaving the colony to start families of their own. When a kit is born, he is well-developed physically. His eyes open right away, and he has his teeth and his full coat of waterproof fur. Because the kit is so well-developed, he is able to start swimming on the day he is born, though he sticks to the water inside the family's lodge. The mother in the family may give birth to between one and six kits every year, typically between April and June. Though a kit is born able to swim, he stays in or around the lodge for the first month of his life. A few days after his birth, he may leave the lodge with his mother or father to explore the area -- otherwise, he stays put until at least two weeks have passed, at which point he is fully weaned and can venture into the surrounding areas on his own. He learns how to build lodges by observing his parents and older siblings, and he develops his reflexes and strength by wrestling with his brothers and sisters. The family is tightly knit, and the beavers take turns grooming each other. 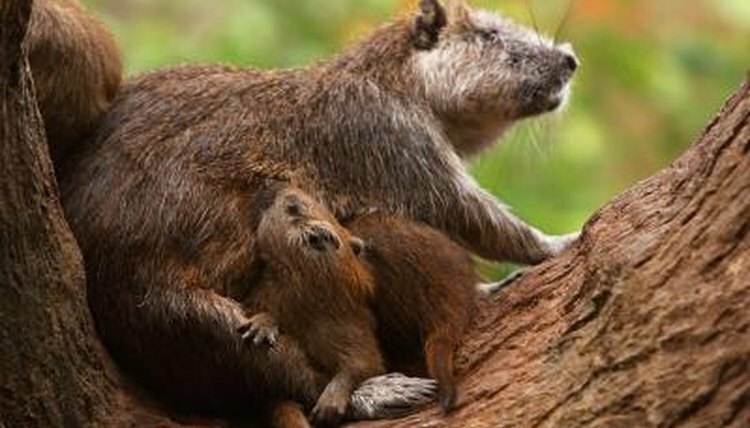 Because the members of a beaver family, or colony, are so close, a kit continues living with his parents for several years. A beaver lives in the lodge with his mother, father, brothers and sisters until he is about 2 years old, at which point he is not yet sexually mature enough to mate, but independent enough to leave the area and start building his own lodge using the skills he learned from his family. He won't start a family of his own until he is about 3 years old. Unfortunately for the kit, his small size makes him highly vulnerable to woodland predators like bears and wolves -- at birth, he only weighs about 1 pound. Once he grows to adulthood, his significantly larger size -- as much as 70 pounds -- effectively deters predation. While he is a kit, though, he is equipped with the physical adaptations that make it easier for him to swim and evade predators, like webbed feet, a large, paddle-like tail and a set of translucent eyelids that enable him to see under water.